Even veterans of the Texas deregulated electricity system can have trouble wading through the dozens of suppliers in the marketplace to find the best retail energy providers. With so many options, it can be difficult finding REPs that are trustworthy, affordable and have the features shoppers want. That’s where SaveOnEnergy.com® can help. We compiled an extensive list of information on every competitive provider featured in our marketplace – from home-services offerings and loyalty programs to 24-hour customer service and smartphone apps – to help you choose the best provider for your budget and needs. Enter your ZIP code here to view today’s plans offered by our best providers in your area. Texas-based 4Change Energy donates 4 percent of its yearly profits to local charities, including the American Cancer Society and Feeding Texas. 4Change Energy offers several fixed-rate electricity plans and has eco-friendly options sourced from 100 percent Texas wind. Bounce Energy serves Texas deregulated energy customers, ensuring that the company’s resources are being put right back into its home state. Texans who want to be rewarded for their business should consider Bounce Energy; the REP has several rewards programs, including Mommy Merits, cash back offers and American Airlines miles bonuses. With more than 2 million customers across the country, Champion Energy Services aims to provide Texans with affordable energy options. Customers can track their usage with weekly energy reports and have access to toll-free customer service 24/7. Cirro Energy is a Texas REP that specializes in affordable fixed-rate electricity plans. Cirro Energy customers also can benefit from the provider’s range of home protection plans and Visa gift cards ranging from $100 to $500 for referrals. Direct Energy is one of the largest competitive suppliers in the U.S. with more than 4 million residential and business customers. Based in Houston, Direct Energy strives to give Texans the necessary tools to make educated choices for their energy needs. 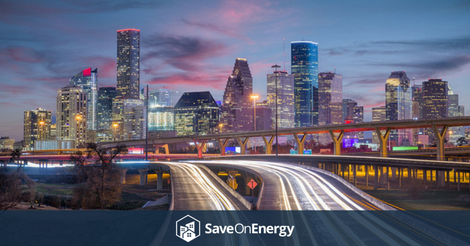 Founded and based in Houston, First Choice Power exclusively serves the Texas deregulated electricity community. Customers can take advantage of First Choice Power’s zero-deposit electricity plans and monitor their monthly energy usage, all through the online account management system. As the only 100 percent renewably sourced supplier on our list, Green Mountain Energy is the perfect provider for eco-conscious Texans. Green Mountain offers pollution-free plans sourced from wind or solar energy, as well as a residential solar installation program to help customers make the most of their home PVs. About 1.5 million energy customers have chosen Just Energy as their competitive provider. Just Energy offers a number of affordable plan options in the SaveOnEnergy.com marketplace, including green energy sourcing through the purchase of Renewable Energy Credits, known as RECs. Pennywise Power is a back-to-basics REP that emphasizes low electricity rates without the “unnecessary extras.” Texans who choose Pennywise Power can be assured that their money is going toward dependable electricity with high-quality customer service. With smart home technology discounts, a referral program and home-services offerings, it’s no surprise that more than 1 million Texans choose Reliant Energy as their retail energy provider. Reliant Energy is also provides 24/7 live customer service. TriEagle Energy, now backed by Crius Energy, is a top competitive provider in the Lone Star State. A great choice for those concerned with their energy consumption, TriEagle Energy offers customers a monthly efficiency scorecard, in addition to customized usage tips for their homes. As one of the first retail providers to enter the Texas deregulated energy market, TXU has served the Lone Star State since 2002. In addition to providing its 20,000 customers with reliable electricity, TXU Energy offers renewable energy options, home protection plans, free nights and weekends energy plans and a wealth of information about the Texas deregulated energy system. How soon can I start my service? What happens if I move before my contract is up? Will I have to pay if I cancel my service before my contract ends? Each provider’s percentage score was then calculated to create the list.